So guys, I know it’s been a while since I did much posting on here, but here’s a good headliner for you. The first man to set foot on the moon, dies…on the moon. Okay he didn’t die on the moon, but it was good banter. The pic and caption up there you see was from the Aperture Science page on Facebook, and before anyone asks, yes that’s Latin for “To the stars and beyond’. 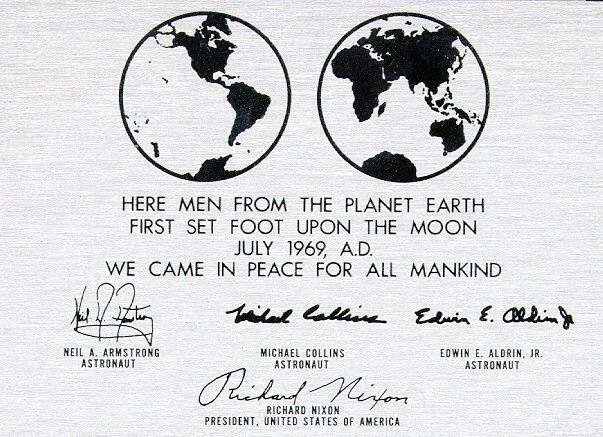 Armstrong was commander of the Apollo 11 mission that made the first manned lunar landing on July 20, 1969. He had undergone heart surgery Aug. 8, three days after his 82nd birthday. His family said that Armstrong had passed from post-surgery complications. As he stepped off the lunar module and set foot on the moon’s surface, he said “that’s one small step for man, one giant leap for mankind,” underscoring a centuries-old fantasy among human kind and a high point in the Cold War era space race between the U.S. and the Soviet Union. An estimated 500 million TV viewers watched the event, engrossed by the surreal, grainy black-and-white footage. The notoriously publicity shy Armstrong was a reluctant hero. In an era of celebrity adulation, Armstrong refused to sign autographs or grant interviews, giving only infrequent speeches. “I don’t want a living memorial,” he once said. He reluctantly joined fellow Apollo 11 astronauts Buzz Aldrin and Michael Collins in anniversary celebrations of the moon landing. Armstrong flew Navy fighter jets during the Korean War, flying nearly 80 missions and later became a test pilot before joining the National Aeronautics and Space Administration, as part of its second group of astronauts. Armstrong commanded Gemini 8 in 1966, which suffered near disaster until he used a back-up system to stop an uncontrolled capsule spin and made an emergency landing in the Pacific Ocean. Armstrong’s prowess was again demonstrated following the moon landing, when it was later revealed that lunar module had just 20 seconds of fuel left when he steered to avoid large boulders before touching down in the Sea of Tranquility. The self-described nerd downplayed hero status. Born in tiny Wapakoneta, Ohio, Armstrong took his first flight as a six year old, fueling a lifetime passion for aviation. He attended Purdue University to study aeronautical engineering before the Korean War, later earning a master’s degree at the University of Southern California. The lunar landing made him more popular than his hero, aviator Charles Lindberg, but Armstrong shunned the spotlight. After walking on the moon, he lived a mostly private life, buying a farm and teaching aerospace engineering at the University of Cincinnati until 1979. So there you have it guys, the man was a Hero, not An Hero. This is Grass signing out, peace.